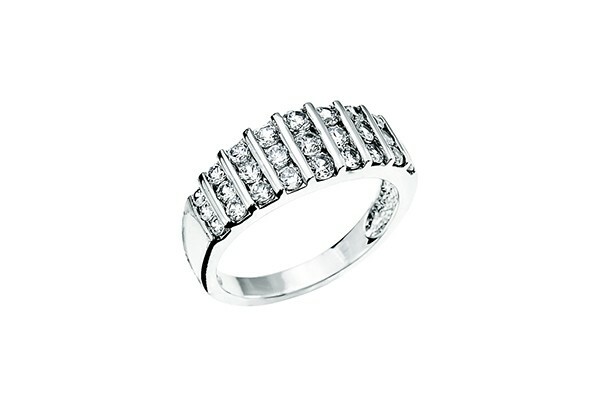 Thicker in the middle and thinner on the sides, this band features nine columns of round cut simulate diamonds weighing at approximately 1.00 carat. This ring gives the illusion of great depth with the stones decreasing in size as they drift away from the center. 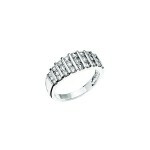 A total of 27 stones perfectly aligned give this ring a clean modern look. .925 sterling silver lines are raised showing a contemporary design. Easy to pair with any look, can be worn on either hand and looks great on the index, middle and ring finger. A stunning wedding band subsitution!